The constellation Pisces appears in the shape of the letter V. Al Risha lies at the tip of the V, where the two lines come together. You might also notice The Circlet in Pisces. It can help you find the V, and Al Risha. Alpha Piscium, or Al Risha (also spelled Alrisha), isn’t one of the sky’s brightest stars. In fact, it’s only about 4th magnitude, which is getting down to a level of faintness that requires a dark sky to see. 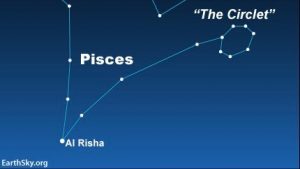 But Al Risha is a fascinating star in a prominent place in the zodiacal constellation Pisces the Fishes, which is one of the sky’s most graceful and beautiful constellations. It’s also very easy to pick out in Pisces if you have a dark sky. Pisces the Fishes is always shown as a pair of fish, swimming in opposite directions. The Western Fish lies in the graceful line of stars south of the Great Square of Pegasus, and the Northern Fish is another line of stars to the east of the Square. Al Risha represents the knot or cord that ties the two Fish together by ribbons at their tails. In fact, Al Risha means “the cord” in Arabic. Al Risha, the Alpha star of Pisces the Fishes, via the Space Telescope Science Institute. Northern Hemisphere autumn (or Southern Hemisphere spring) is a good time to see the constellation Pisces, with the star Al Risha at its heart, in the evening sky. As seen from across the globe, Pisces reaches its high point for the night at about 10 p.m. local standard time in early November and at about 8 p.m. in early December.